Title: Whose train is it? Description: NS 9244 & 8690 led an easbound train through Wauseon, OH. Description: NS 272 rolls west at Wabash on the Huntington District. Description: NS Southbound Freight Train 393 at 32nd Street Interlocking in Birmingham, Al. Description: NS 214 meets the first light of a misty dawn as it blasts east through CP67 at Bloomsbury, NJ. 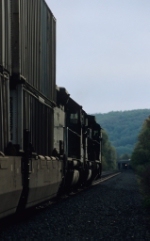 Description: 214 heads straight for Musconetcong Mountain as NS 19G rounds the curve under I-78, slowing to wait for 214 to clear CP67 early in the morning of May 7, 2005. Description: NS 12T gets the highball at MP 223. Description: At Stoddard Street we see UP Train ADEWF 21 coming through the crossing with the horn blowing. I was finishing my KFC 3 Chicken Strips and a Famous Bowl, yum! Description: A second section of 262 heads into CP 88. Description: I62's power drifts back into Allentown Yard. Description: NS train 361 prepares to blast off after coupling to it's train. Description: 174 kicks up yesterdays snow while northbound on the NS Marion Branch.